A very disgraceful video of some policemen hailing a young kidnapper has gone viral online. 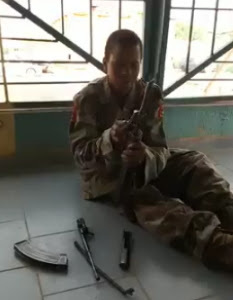 In the shameful video footage released by a police officer on Facebook, notorious Fulani Kidnap kingpin, Umar Ibrahim was seen being hailed by some policemen as he assembled an AK47 rifle within minutes. The 25-year-old troubled man was arrested and paraded alongside 15 others earlier this month. He reportedly killed over 10 of his victims and drank their blood. What stands Umar’s kidnap gang out of others among the country is that they kill their victims after collecting ransom and drink their blood. 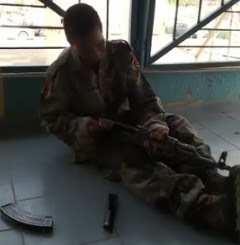 Here is the viral video of Ibrahim Umar assembling an AK 47 rifle. Police hailing a kidnapper??? Haba Naija Police…. He is not only a kidnapper but a terrorist, he is among many they are referring as herdsmen. He will soon be release because his god father is CEO of Nigeria..NONSENSE. Have we all lost our senses in this Country? How do we feel so comfortable with a Criminal and think it is funny? This guy is being arrest for the horrible crime of the Century and you can do as law enforcement agents is to following him mocking the dead victims. 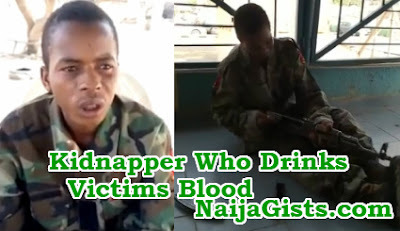 This guy was not only charged for killing innocent people but drinking their blood OMG!. This is the reason why we cannot get ourselves out of shithole we push ourselves into because we fond of celebrating crime. This guy should be tied and fed to crocodiles.